Most of us have standard knives in our kitchen cutlery such as a paring knife, a butcher knife, a bread knife, a chopping knife, slicing knife, and, of course, steak knives. 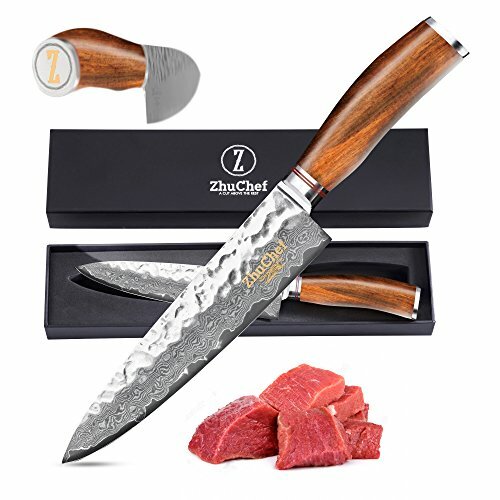 Nowadays, there are also many different types of high-carbon steel Japanese knives on the market these days and would make a great addition to your kitchen knife set. The santoku knife, the Japanese gyuto knife, the nakiri knife, and the sashimi knife are just some of the specialist knives available. If you’ve never used Japanese style chef knives then you probably don’t really know what all the fuss is about. You may not even know why there’s such a big deal about these types of knives and what it is that makes them better than traditional styles of knives, but the important thing is that you take a look at them right away. There are plenty of great features to Japanese chef knives and, if you know what you’re looking for, picking a Japanese knife can end up being a better culinary cutlery pick than a traditional Chef’s knife. Japanese knives come in a range of different styles and we’re going to talk about all of the different features and qualities they have to offer. When you’re looking at getting a brand new chef knife, you always want to make sure you’re getting good quality—but sometimes you can’t quite afford what you think you need. The important thing is taking a look at what’s out there and what you should really need. When you take a look at this guide we’re going to help you find a lot of great features about chef knives and specifically Japanese style chef knives that are going to help you get the overall durability, strength and more than you need. There’s a lot to choosing a good quality knife, after all. In this guide, we’re going to look at features, but once we’re done with that we’re also going to look at several different options in the way of Japanese chef knives. That way you’re going to have no problem finding exactly what you need to get started on your next cooking project. We’re going to take a look at multiple construction points of the knife including profile, steel type, blade, and more. The first thing we’re going to take a look at is the profile of the knife itself. The profile is simply the way that the blade curves and how it’s going to allow the blade to rock. A German-style profile is going to have more of a rocking motion to it and will have a bit of a curve from the front to the back. On the other hand, a French-style profile is going to provide a curve to the edge but then it provides a much flatter end to the overall profile of the blade. Japanese knives will be anywhere between the two so it’s going to be up to you to understand your technique to get the right knife profile. There are several different types of steel out there and you’re going to want to take a look at each of them in order to decide what’s going to work best for you. Carbon steel is going to be sharper, more durable and longer lasting, but it’s also the most prone to rusting over time. If you’re not careful with it and don’t keep it clean and dry at all times you could easily end up with damage. On the other hand, stainless steel provides a good level of sharpness, durability, and longevity but it’s not going to get to that excellent stage. Still, it’s not going to have as much problem with rusting. Finally, we look at the blade, but there is a range of different features when it comes to the blade. You’ll want to look closely at things like the asymmetry, the cross-section and the cladding. First, we’ll take a look at cladding, which basically means the coating around the exterior of the blade. Different types of knives will have different types of cladding, which may cover all or part of the knife. In general, Damascus is one of the more common types of cladding but kurouchi is another common version. They can be added in a variety of different ways but can enhance the durability and also make the blade look nicer. The cross-section is the next part we want to look at and it refers to the sharpness of the blade as you go down. At the tip of the blade is going to be the very sharpest portion but right behind that is going to be very important when you’re cutting or chopping anything. You want to look at the overall thickness of this portion. You don’t want something that jumps too quickly to being thick after the thin edge because it could get damaged easily when you’re trying to cut or chop anything hard. Asymmetry is the way that the blade itself is cut. If it’s exactly the same on both sides then the blade is symmetrical. On the other hand, a gyuto—the Japanese style chef knife—is generally asymmetrical. This can be a problem for someone who is left-handed since most of these knives are designed for right-handed users. The asymmetry of the blade means that it can only be used one way. It helps to make the food you’re cutting release a little easier and more smoothly. A good quality handle is another important feature because you want something that you’ll feel more comfortable with. A western style handle is generally called a Yo Handle and has a bit more balance though it’s going to be heavier overall. On the other hand, a Wa Handle, which is more Japanese style, is going to be lighter weight but will tend to be heavier in the blade rather than fully balanced. Finally, the length is another feature you’ll want to look at. This can vary anywhere from 8” to 12” (generally) though you may find some knives that are larger than this. You’ll want to take a close look at what you’re going to be cutting and just how comfortable you are with a larger or smaller knife in order to get the ideal size for you and the tasks you’re going to accomplish. It has nothing to do with your physical size and more to do with what you’re cutting. Now that you’ve had a chance to dive in and look over all the qualities you should be analyzing before buying a Chef’s knife of the Japanese variety, let’s look at some of our favorite models. All of these particular knives have been battle tested and used out in the culinary field extensively. Any one of these Japanese Chef’s Knives would make a great addition to your kitchen, so let’s go ahead and dive in. This 8” chef knife is vacuum treated and hammered for a strong and durable finish. It’s also made with AUS-10 steel so you’re going to get strength and durability. The blade itself has a sharp edge that’s designed to be as smooth and ready as a scalpel. Not only that but it’s hand finished and creates a mirror polish with 8-12” per side. The nitrogen cooled steel is harder, flexible and corrosion resistant as well as featuring a full tang. This increases the overall strength of the blade and the knife itself. There are 66 layers of high carbon stainless steel that increases strength and helps to cut down on the stain possibility. Even better is the Damascus woven within the blade and the high-quality handle that’s made to a military grade. It’s ergonomic and hands polished so it’s smooth and comfortable to hold. You’ll also get just the right amount of knuckle clearance to keep you comfortable while using the knife. If you’re not happy with it for any reason there’s a lifetime warranty and a money-back guarantee as well. This knife looks elegant and sleek when it’s being used or even when it’s just sitting in your knife block, though you’ll never need to do that because it comes with its own case. 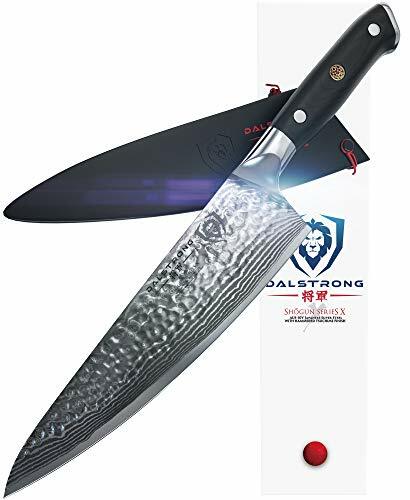 It has 67 layers of high carbon stainless steel to provide enhanced durability and strength but also has a Damascus hammered edge to give it an asymmetrical blade and even more corrosion resistance and sharpness. The settle itself has been honed by the traditional Japanese process and the handle is forged of rosewood for a more elegant look. Overall, this knife is ready for absolutely anything and is made to be comfortable for any tasks that you need to accomplish. It has a non-slip grip that’s polished to create a more matte finish. Even better, the knife itself comes with a lifetime guarantee so you can make sure that it’s exactly what you want and you’ll never have to worry about any damage that comes from normal wear. You can just contact the company if there’s ever any problem and they’ll take care of it right away. This knife is actually just over 8” in length but provides a more modern and western style with the Japanese features that you’re looking for. It’s even edged and completely capable of being used by right-or left-handed users as well as being entirely stain resistant. 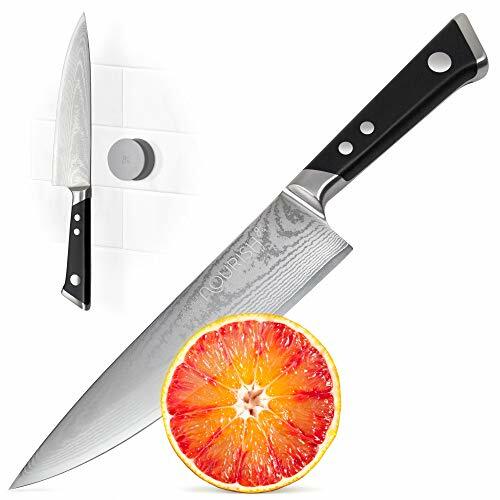 Lightweight and made in Japan, this knife has the double bevel that you need and is made with VG10 stainless steel to create a sharp but still smooth edge that you’ll be able to use to cut through just about anything you have in your kitchen. This knife is not going to look quite as stylish as some of the other options that we’ve looked at but it does have some excellent features and can make sure that you’re going to get the quality that you need at the same time. It’s also a way that you can save a little on cost because it’s a more simplistic design and knife. Still, it has a comfortable grip and excellent riveting to hold the entire thing together smoothly. This chef knife is an 8” option that comes with its own box to keep it protected from anything that might be happening around it and to keep it ready to go at any time. This knife is made with high carbon stainless steel which makes it durable and long lasting and also keeps it anti-corrosive so you don’t need to worry as much about what can happen as you’re using it. You’ll still want to keep careful track of this knife and keep it clean at all times, but it’s less likely to rust that easily than other carbon knives. You can cut through anything with the super sharp blade and the ergonomic style handle is definitely going to help you in the long run. It’s smooth and sleek looking so you’ll have no problem using it and it’s made to help you resist fatigue over time. It has an ideal level of resistance and offers a unique blade with a beautiful pattern over the entire thing. 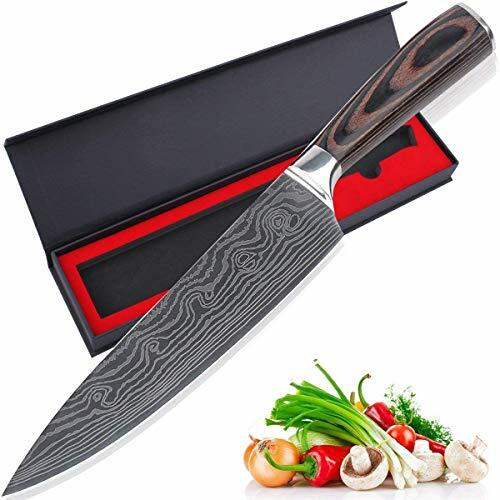 Finally, this chef knife is also 8” and features a Damascus steel coating that is made to keep it more durable, stronger, and elegant at the same time. The knife has a half bolster to keep your hand protected but also keep the knife blade ready to be sharpened whenever you need it. The outer steel makes it look sleek and elegant while still allowing the stainless steel interior to keep it less susceptible to corrosion and other kinds of damage. You’ll be able to get a sharp edge and keep it easily. With this knife, you get a basic style handle that’s ergonomic and comfortable for you to hold even for an extended period. You won’t have problem getting a good grip and cutting through just about anything because of the POM style handle. It is made by hand and even comes with a simple sheath that makes it easier to store no matter where you are or what you need it for. Any of these knives are designed to give you a great level of quality, durability, and more. They are each 8” knives that provide the basic features of a chef’s knife as well as enhancing those features with elegance and beauty that comes alongside the standard Japanese style knives. You really won’t go wrong with any one of them, but whichever you choose you’re going to have no problem accomplishing some really great things in your kitchen. All it will take is a little bit of looking at each of these options and before you know it you’re going to have a great knife in your kitchen as well.